A solid white sired by the fabulous Silverstream Faberge, Supreme Champion at the 2010 Alpaca Association National Show. Faberge has now been exported to Europe, so males sired by him are keenly sought after! DNA Sire Verified, Hunter has a pedigree recognised as superior by New Zealand alpaca breeders, including such alpacas as PERUVIAN HEMINGWAY G171 (USA), ILR ALPINE FIBER’S BRUTUS (Imp. U.S.A), ILR PERUVIAN DON JULIO G159 (Imp. U.S.A), PUCARA JULIANA (Aus), NWA LTD RUFFO G4574 (Imp. U.S.A) plus others. Pucara Juliana deserves a special mention as she is the dam of numerous Supreme Champion winners, including at least 3 AANZ National Show Supremes! Hunter is a smaller statured male, but manages to pump out the fleece anyway – he averages over 4 1/2 kilo every shear! Add to this his crimpy fleece, and low micron for age, and you have a very desirable package. 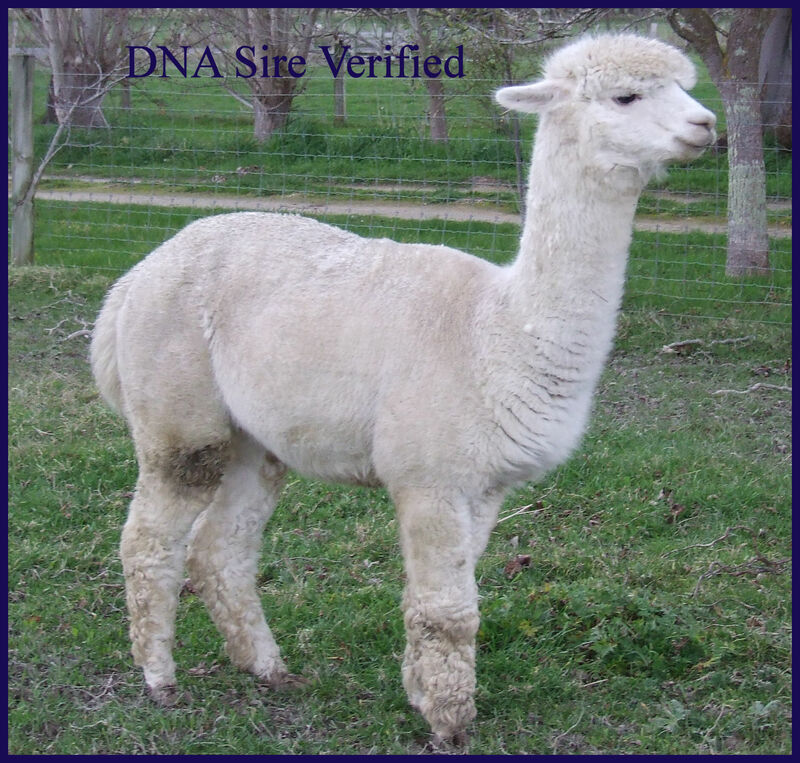 His cria have impressed us with dense, soft fleeces – Hunter has the potential to sire many valuable cria.